The George Armstrong Peters Prize celebrates the memory of Dr. Peters who was described by William Gallie as "the best technical surgeon of all of my teachers". The Peters prize is awarded to a young investigator who has shown outstanding productivity during their initial period as an independent investigator, as evidenced by research publications in peer reviewed journals, grants held, and students trained. In his Peters Prize Lecture, Teodor Grantcharov, this year's winner, told us that "the operating room is a high risk environment in which patients encounter major complications in 3-17% of cases. Between 44,000 and 98,000 patients in the United States die because of medical errors. 40% of these are operating room errors, of which 50% are avoidable." 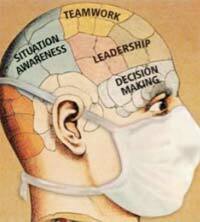 "The current pressures on surgical education require a revision in our thinking and training. The hours are shorter for training, there are decreased clinical opportunities for residents compared to their teachers, the technology has become more complex, there is a focus on error, patients are demanding, and there is a focus on quality of life for residents. All of these pressures diminish the opportunities for trainees. Currently, we still hold to the idea that time is the constant and proficiency is the variable. We still use subjective assessment, learning by doing, and there has been little change in the curricula over the last several decades. It is time for us to move from a fixed time to proficiency as the criterion for completion of training." Teodor's first research project in Toronto asked the question: Can simulation training produce skills that transfer to the operating room? 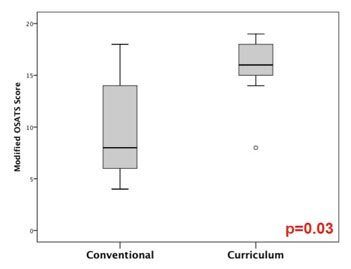 The study results clearly confirmed the effectiveness of simulation training in shortening the learning curves for surgical trainees. The simulation-trained residents achieved proficiency before they entered the operating room. When the cost of training techniques is estimated, operating room training is far more expensive and the transfer effectiveness of simulation training is more than twice that of box or actual operating room experience. A competency based curriculum accounts for differences in ability and skill at the outset, eliminates the learning curve in the operating room, and pre-trained residents learn much more effectively when they do enter the operating room. It also ensures that basic competencies are achieved and tested. The essential components of a successful curriculum based on American College of Surgeons consensus meetings (1) include development of cognitive, psychomotor and team skills. The animal lab serves as the final testing ground before the operating room. Team training has been largely ignored in surgical education and there is a need for educational interventions in this domain (currently only half of the Canadian and 30% of the US programs offer team training component). Figure 1 illustrates the essential elements of team training: situation awareness, leadership, teamwork and decision making. Teodor told us that error is inevitable if humans are involved and the "deny, forget, ignore and repeat" response is unacceptable. 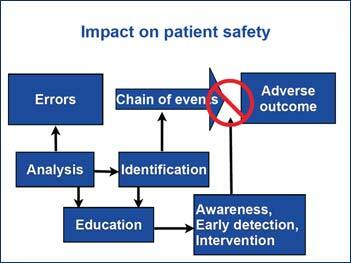 The solution is performance analysis, education, and deliberate practice to mitigate errors and interrupt the chain of events that leads to adverse outcomes (Fig. 2). Teodor's group has developed a black box multichannel performance analyzer to reduce surgical errors. It records many variables in the operating room, including noise and distractions. The pathway for interrupting this is analysis, identification, awareness, early detection. Vanessa Palter, working with Teodor, reported a randomized control trial in the Annals of Surgery, comparing conventionally trained with competency-based curriculum trained surgical residents. The difference was striking (Fig. 3). In the discussion period, Jim Rutka asked about the problem of taking uncorrectably non-proficient surgeons all the way through training. Teodor answered that 5% of residents show outstanding abilities at the outset, 8% never become proficient and the rest achieve proficiency with training. Training individuals who don't have the innate abilities is a waste of personal and training-system resources. To find a way to screen out those who should not become surgeons, Teodor is working with medical student volunteers, using functional MRI to determine aptitude or ineptitude.